Silicon carbide (SiC) chips are finally reaching an inflection point in the power electronics market where they significantly improve switching performance and thus boost efficiency for motor control and power conversion circuits in power factor correction (PFC) power supplies, chargers, photovoltaic inverters, and trains. 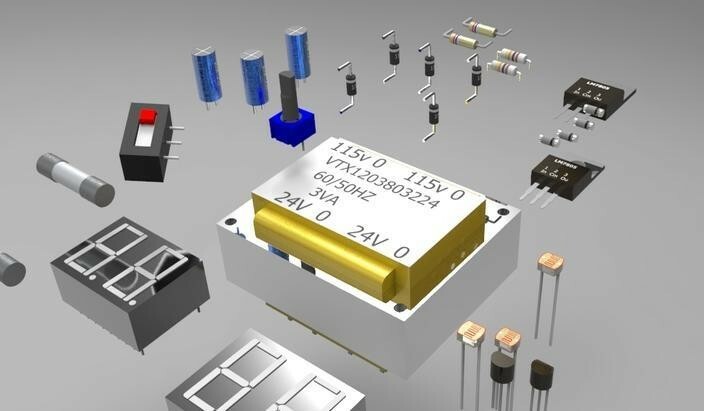 Moreover, while SiC diodes account for nearly 85% of the current shipments, according to Yole Développement (Yole), SiC transistors are growing far more rapidly. The Yole analysis also shows that right now PFC power supply is the leading application consuming SiC diodes. PFC power supply consumes large volumes of these diodes used in high-end power supplies for data centers, cellular base stations, and industrial applications. Rohm’s 1200V/300A SiC power module for inverters and converters in solar power conditioners and industrial equipment integrates a Schottky barrier diode (SBD) and MOSFET into a single package. Image courtesy of Rohm. SiC semiconductor material, which has larger bandgap and higher electron mobility, can operate at higher voltages with lower leakage current. Next, SiC transistors and diodes can function at higher frequencies and sustain greater temperature without a compromise on reliability. Furthermore, fewer crystal defects compared to silicon materials make them highly suitable for power chargers in electric, hybrid, and fuel-cell vehicles. The fact that size and weight considerations are crucial in automotive design also makes SiC chips invaluable as they can reduce the need for thermal management, heatsink, and cooling devices in vehicles. Toyota, for instance, claims to have achieved 5% fuel efficiency by reducing the size of power control systems by nearly 80%. Then, there is Rohm’s recent design win with Tesla for SiC Schottky diodes in EV chargers that further affirms the promise of SiC technology in hybrid- and full-electric vehicles. The SiC MOSFETs offer nearly 10 times the breakdown field and three times the thermal conductivity compared to their silicon counterparts. So what's holding them back? For a start, SiC devices are relatively new to the production facilities and that leads to higher wafer costs. The 1,000 volt SiC MOSFET fromWolfspeed, now part of Infineon, is targeted at electric and hybrid vehicles. Image courtesy ofWolfspeed. The Yole report also points to the supply chain issues, especially for 6-inch wafers, where Infineon now holds a commanding position after its acquisition of Cree's power and RF division specializing in SiC devices: Wolfspeed. The report asks an important question: Will Infineon continue to supply SiC wafers to other chipmakers like Cree did? There are also packaging and connectivity issues; here, industry observers anticipate that Infineon's status as a leading chipmaker can fast-track the development and production yield gains for SiC products. For instance, Infineon can use its manufacturing prowess to lower the bar on otherwise high SiC wafer costs. The year 2017 is likely to bring a lot of clarity to the future of SiC devices in power electronics.